The Venetians are at the side of their compatriots living in Venezuela and of all the Venezuelans so that they can soon have a future of serenity and freedom. Also in Rome, an anti-democratic regime like that of Maduro is installed. [Venice, 4 February 2019] – In these hours all the major European countries are recognizing Juan Guaidò as the legitimate President of Venezuela. We recall that the constitutional mandate of President of Maduro ended on January 10, before new free and democratic elections could be held. However, on 10 January, Maduro himself proclaimed himself again by violating the country’s constitution and effectively preparing an anti-democratic coup. Moreover, Article 233 of the Constitution of Venezuela gives the president of the National Assembly (Parliament) the role of temporary president, or substitute, until the restoration of the democratic order and the convening of new free elections. Among other things, the National Assembly is the only power left in Venezuela that has been elected by the democratic vote. 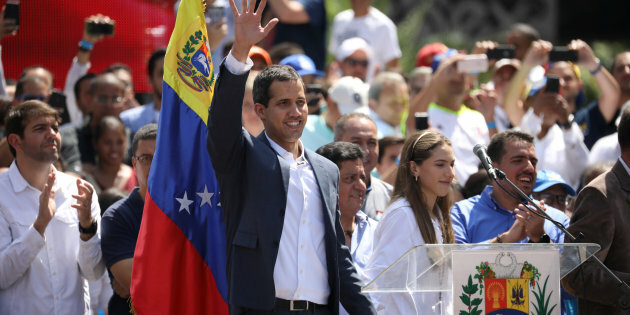 The President of the National Assembly is precisely Juan Guaidò, who therefore moved in the proper vein of the Venezuelan constitution and respect for democracy, unlike the dictator Maduro. It is therefore false what many Italian newspapers wrote that Juan Guaidò “self-proclaimed” President. Instead he has moved with great courage and responsibility and in the flood of legality and defense of democratic freedoms, challenging the violent reaction of the regime of Maduro, which instead lacks any legitimacy and elective democratic representation. Plebiscito.eu, the independence movement that has managed to bring the Venetian question to the attention of the whole world with the referendum of independence of Veneto in 2014, therefore recognizes Juan Guaidò as the legitimate president of Venezuela, who has already pledged to convene new free and democratic elections, to restore peace in one’s own country. Plebiscito.eu also stigmatizes the cowardice of the Italian government that with its position of fake neutrality and false equidistance, actually reinforces the bloody dictatorship of the regime of Maduro, which in fact in recent days has thanked Rome. Italy thus confirms itself to be an anti-democratic regime with a socialist imprint (like that of Maduro) which is based exclusively on the theft of the tax resources of the Veneto, today placing itself even more outside the civil and democratic Europe, with positions that see it aligned with the most intolerant and illiberal regimes. The independent Veneto will instead be at the side of its European brothers, in the defense of the peace of democracy. We believe that the lesson of the last century was enough to leave aside any ideological adventure, even if the Roman regime shows to repeat the errors of the past. We also remember that many Venetians live in Venezuela, since they have emigrated in recent decades and we are particularly close to them during these difficult days. We believe that the courageous and democratic action of President Juan Guaidò will give back to them and to all the Venezuelans a future of serenity and freedom.